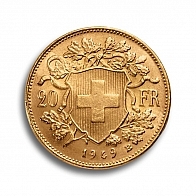 Buy Swiss Vreneli gold coins. Although Switzerland is famous for its precious metals refineries, the country does not manufacture its own gold bullion coin currently. The Vreneli is the only Swiss manufactured gold coin currently available - it was manufactured by the Swiss government until 1949. Each coin contains 5.8 grams of gold bullion. Similar sized gold coins are issued by other European governments, including the Rooster and Napoleon, both issued by France, and the gold Lira, issued by Italy. Gold Vrenelis may be purchased for delivery or tax-free storage.